St Andrew’s Church in Barnt Green (B45 8NR) will once again host The Sinfonia of Birmingham for an evening of orchestral music under the baton of Mike Seal, Assistant Conductor of the CBSO. On Saturday July 9 at 7.30pm, the orchestra will play Stravinsky’s Pulcinella Suite, Prokofiev’s Classical Symphony and Beethoven’s Symphony no 8. Talented young Worcestershire musician Rebecca Eldridge (pictured) makes her debut with the Sinfonia, playing Weber’s bassoon concerto. Rebecca began playing as a child in Redditch and subsequently studied at the Welsh College of Music and Drama where she was awarded a first class honours degree and also the Concerto prize. She continued her studies at the Guildhall School of Music and won the Three Choirs Festival Ensemble Prize and the Abergavenny Eisteddfod. 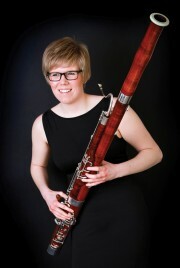 Now a freelance bassoonist, Rebecca plays with the Orchestra of the Swan, the Royal Shakespeare Company, the Welsh National Opera orchestra and the Young Musicians’ Symphony Orchestra. She has also performed concertos with various orchestras and is a founding member of the Aquilon Orchestra. The Barnt Green concert Is part of the Bromsgrove Festival. Tickets cost £10 (seniors £8, concessions £6 and under-12s free) and are available on 0121 447 7671, at http://www.sinfonia.org.uk or, if available, on the door. Advance booking is strongly advised to avoid disappointment.